Binoculars have changed the way we perceive the world. It is an optical device which was designed on the principle of function of another optical device, the telescope. A telescope, however useful, had its limitations due to the use of a single eye for viewing. This affected the projected image and put a strain on the eye. By utilizing two scopes rather than one, binoculars have perfected the already existing technology. Binoculars are an essential piece of equipment if you are into cartography, navigation, sniping or any other similar occupations. Also, it is a tool much needed for hobbyists like bird watchers, stargazers, hunters, etc. A high-end, well-designed binocular can easily cost you about $500 and higher. However, there are many models out there which can be bought for as little as $200 and can provide with the same performance as any high-priced binocular. 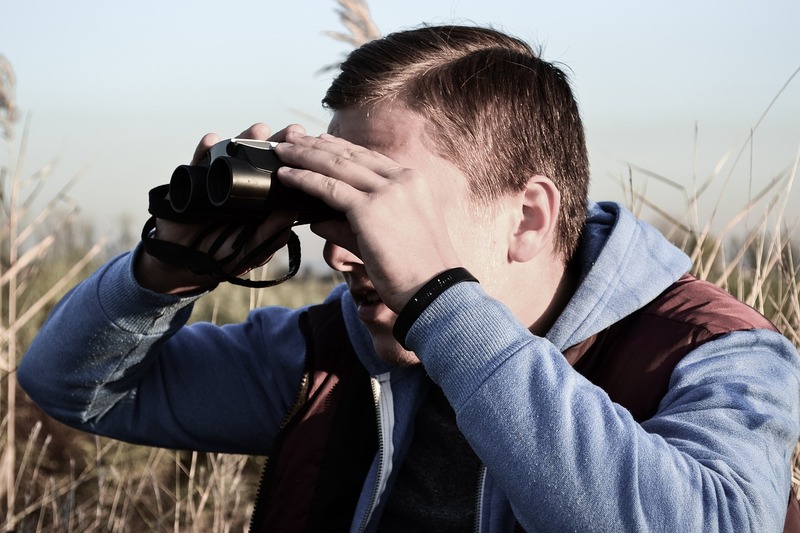 What is to follow is a well-researched list of features, based on performance and ease-of-use, which an average or professional can refer to while buy a good and cheap binocular. What to look for in Binoculars under $200? A binocular is one of the most useful pieces of outdoor equipment. Since they are a little on the expensive side of the scale, it is always a good idea to know the things you are going to look for before purchase. Below $200 or above, this is always a good practice. Magnification power is the ability of the instrument to display the image as larger than what it is. Most prefer a magnification of about 6x to 10x. The magnification power is all dependent on your use. For example, in bird watching, higher the magnification the better. However, large magnification compromises field of vision and light quality. The objective lens is the name given to the large lens which is in front of the binocular. This lens is a crucial part of the instrument as this is the place light first makes contact with in the binocular. A large lens is always better as it means more light enters the tube and enhances the image. The large lens also means more weight, so a good tripod and carry case will go a long way. Lens coating is an important aspect as it affects the final image quality. The lens is made of glass and will reflect some light; this reflected light disrupts the incoming light. A good lens coating will reduce reflection, improve image quality and reduce strain on your eyes. Exit pupil is present on the user’s side of binocular. This part of the binocular is the part on which the final image is projected and then can be viewed by the user. A large and comfortable eyepiece can help you when it comes to prolonged viewing and it also reduces the strain on your eyes. Field of View or FoV refers to how much of the field is visible when viewed from the binoculars. It is generally depicted as degrees in the form of the diameter of a circle. A large field of view means you can view a larger picture from one single position. A small field of view can be uncomfortable as a lot of neck movement would be required to cover a large area. Close focus is the term used for the minimum distance you would have to be from the observed object to be able to focus on it. As an unfocused image would defeat the purpose of a binocular, this is an important aspect. If you buy a binocular with a small close focus, the better you would be able to use it. It goes without saying that since binoculars are an optical device, the quality of the projected image is of much importance. The visual clarity of the produced image can depend on many factors. Lens material, objective lens size, prism used, prism alignment, ambient light quality and many other factors could affect the light quality. Low light performance, as the name suggests, is how well your binocular performs in low light conditions. In low light conditions, you need more light to enter the binocular for a better image. This can be achieved with a large objective lens. You can always go for night-vision binoculars. Binocular is an outdoor tool. More specifically, it is an outdoor travelling tool. You are prone to dropping or banging it too hard. Before purchase, ask the seller what material the casing and lens is made of. Also, get a good water and terrain proof carry bag for better protection. Simultaneously, opt for an extended guarantee. All the above-mentioned features and parts may function perfect separately, but it is also important to know whether they work well together or not. A large magnification may affect picture quality in low light and compact binoculars may have a small field of vision. Most of the important features are already mentioned above. Other things like company guarantee, quality of tripod and carry bag, prism used, etc. can also be looked into for better performance. Here is a list of some of the best binoculars under $200 or less. 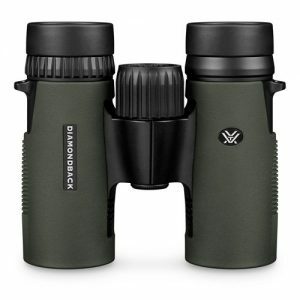 The Vortex Diamondback 8×32 binoculars are fitted with roof prisms, are lightweight and well balanced. They provide noticeably clearer images with greater contrast. The field of view is wider at 420 feet/1000 yards, which is more generous than its counterparts. The phase corrected roof prism and multicoated glass creates stunning images. The external rubber armor is quite textured and provides a strong and quality grip. The dielectric coatings of the prism enhance image resolution, color, and contrast. The focus knob is quite precise and easy to use. Further, the O-ring seal makes them waterproof and fog proof as well. 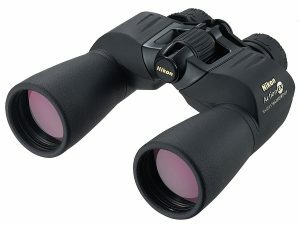 Nikon PROSTAFF 7S 10×42 Binoculars are an ideal choice for those who wish to own good quality binoculars from a reputed brand at an affordable price. They are an excellent pair of binoculars with a stylish design and are one of the most popular binoculars among the masses. Their high quality and innovative components make for a highly desirable pair of binoculars. They fall into the lightweight category because of their total weight of just 22.7 ounces. The ergonomic design features an exterior armor that is rubberized and non-slippery for optimal grip. The rubber coating provides shock resistance and makes them a durable pair of binoculars. 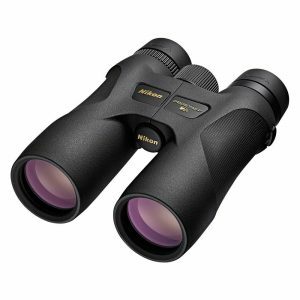 Nikon PROSTAFF 7S 10×42 binoculars come loaded with lots of optical and technological features including phase corrective coated roof prisms, multicoated eco-glass lenses, adjustable eye relief and are waterproof as well as fog proof. The fully multi-coated lenses produce bright and clear images by maximizing the transmission of light through the binoculars and reducing reflection and glare. Phase corrective coating on roof prisms reduces chromatic aberration significantly. They boast of all-terrain applicability because of their resistance to water and fog. The O-Ring seal and nitrogen filling makes it possible to prevent moisture from entering the unit and causing problems. This further helps in protecting the binoculars from dust and impurities, making them dustproof as well. Bushnell has been in the business of creating optical devices for quite some time now. They are known for designing some of the best devices for hunting, wildlife and tactical use. The Bushnell Legend L series has been developed after years of perfecting their art of designing optical devices. Bushnell Legend L series is a compact and small-sized binocular with dimensions 7.2×6.1×3.1 inches and weighs a very light 1.46 pounds. The Legends L series comes with a magnification power of x10. The 42mm objective lens is a perfect fit if you plan on going on a Safari or bird watching. The 18mm eye relief and 4.2mm exit pupil are comfortable to the eye and produce a good final picture. Fully Multi-Coated lens coating reduces light reflection and avoids any image distortion or optical phenomena. The BAK 4 prism produces crisp and accurate images and being coated with a Phase 3 coating enhances the crispness of the image. The close focus of the binocular is found to be 8 ft and has a large field of view at 340 ft.
Bushnell has made its name in the optical devices market by developing products that deliver great performance. They have spent many hours and capital on finding the right recipe to build the perfect binocular. The Falcon 10x50mm is no exception. It is a high-quality binocular made for your viewing pleasure. This binocular is a perfect fit for you if you are into outdoor activities like bird watching and wildlife safaris. It is a wide-angle binocular with dimensions 9.3×8.2×4.2 inches and weighs 1.68 pounds. It comes with a large 50mm objective lens which provides for a lot of light to enter the scope, improving the picture quality. 10x the magnification is able to provide a better-detailed image of the subject. The exit pupil is of 5mm and delivers good image and the eye relief is of 9mm. The binocular utilises Porro Prisms. Paired with an objective lens which has full lens coating, the image produced is distortion and optical phenomena free. The exterior of the binocular is made keeping high durability in mind. It has been created using rubberized, abrasion-resistant finish. Along with an ergonomically design, the Falcon is very comfortable to hold, especially for a prolonged period of time. A field of view of 300 ft means you never miss any action. From one fixed position, you can view large areas without moving your head too much. They are all water-, fog-, and dust-proof thanks to the nitrogen purging and O-ring seals and can be considered tough, durable and dependable. They are an ideal choice for hunting, hiking, camping, etc. The objective lens on this binocular is 42mm in size. As it lets ample amount to enter the scope, the images produce are bright and crisp. A 10x magnification will help you in viewing the subject at much more detailed and about ten times its original size. 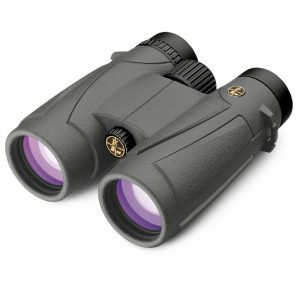 Leupold BX-1 McKenzie 10×42 Binoculars are one of the most popular Leupold products on the market today. They are an affordable unit of all-purpose binoculars that are considered ideal for both indoor and outdoor use. This is partly because of the standard set of features that these binoculars possess and because of the lightweight design. 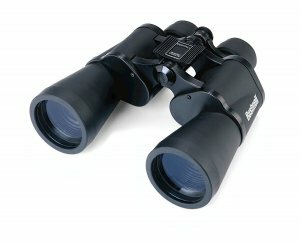 These binoculars have a light chassis of about 22 ounces making them portable and ideal for the 10×42 configured binoculars. Leupold BX-1 McKenzie binoculars are one of the very few Leupold binoculars that have a roof prism design instead of a Porro prism one. The advantage of a roof prism design over Porro prism is that it makes the binoculars lightweight and much more rugged. Also, they improve the light transmission capabilities of a pair of binoculars and reduce any kind of chromatic aberration. The custom twisted eyecups and the wide IPD (Inter Pupillary Distance) range offered by these binoculars provide a true and exact fit for any customer. 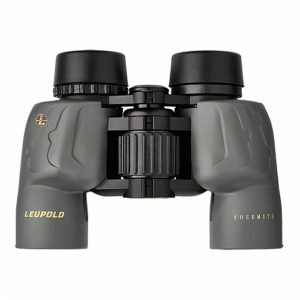 Leupold BX-1 Yosemite 6×30 Binoculars are a small and compact pair of binoculars which are capable of providing an all-around optical performance. These binoculars come with fully multicoated lenses and BAK-4 prisms for a superior level of light transmission and better quality of images. They boast of a 420 feet/1000 yards wide field of view and have a 5 mm exit pupil to support an exquisite amount of light transmission resulting in bright and crystal clear views. This pair of binoculars can be considered high performing as well as user-friendly. The IPD or Inter Pupillary Distance for these binoculars is adjustable which makes it easy to get a custom fit for any user. The design employs Porro prisms with BAK-4 glass to enhance the optical performance. Redfield Rebel 10×42 Binoculars are a worthy pair of binoculars which provide an array of features under 200 bucks. 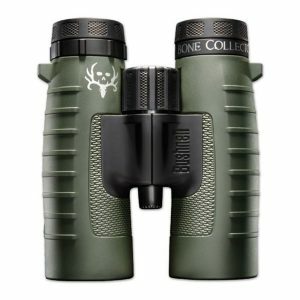 At around $150, these binoculars provide the perfect 10×42 configuration and have everything that you need for your outdoor expedition. The features have been optimized to provide maximum usability. The features include water and fog resistance, fully multicoated lenses, phase corrected BAK-4 prisms, and a fully armored aluminum body. The multicoated lenses provide ultimate light transmission and the BAK-4 prism glass ensures superior and brilliant image quality. The fully armored aluminum body makes these binoculars durable and robust as well as provide a secure grip. 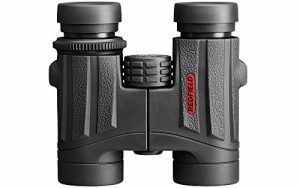 Redfield Rebel 10×42 binoculars are a popular choice among several customers and have received a lot of attention and positive feedback from the reviewers. Nikon is mainly known for creating great DSLRs and their lenses. However, the company has been able to make its name in binoculars and telescope market by delivering the same picture quality as it delivers in its cameras. 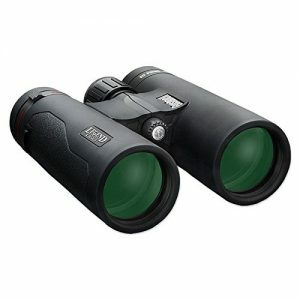 One of the best binoculars that they have delivered is the Nikon Action 10×50 EX. The Action Extreme comes with a large objective lens of 50mm. A large objective lens allows more light from the subject to enter the scope, hence, improving its picture quality. The 10X magnification is able to provide a distortion-free and large image of the observed subject. At high magnification, the low-light performance of binoculars is known to falter. However, the large objective lens compensates for the problem. The scope of standard size with dimensions 9.5×8.4×4.6 inches and weighs 4.8 ounces. Field of view of the binocular is 114 meters and it is able to cover a large area without moving the scope too much. The binocular has a large eye relief, around 17.2 mm and an exit pupil of 5mm. A close focus of 7meters means that any object further than this can be focused upon for better picture. You need not spend a fortune to buy a pair of good binoculars. Many companies exist out there that use good and durable material to create optical products which can be purchased for as little as $200. 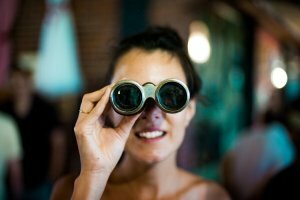 The above article can be used as a purchasing guide for anyone who is in the market looking to buy a binocular at a fair price.